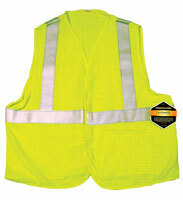 The GlenGuard Hi-Vis Anti-Stat flame-resistant vest meets ANSI 107, ASTM 1506 and NFPA 70E standards. The engineered fabric of the vest helps prevent buildup of static electricity and keeps static from igniting ambient gases with low ignition or flash points. GlenGuard Anti-Stat is currently available in woven fabric.